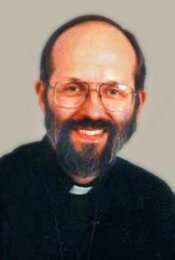 Father Al Lauer, the founder and spiritual leader of Presentation Ministries spent his lifetime in service and self sacrifice for Jesus and His Church. The Members of Presentation Ministries and Guadalupe Bible College, do not want to lose sight of the tremendous contribution Father Al made to us and countless others. At his inspiration and direction, many ministries were initiated and are flourishing today. Fr. Al experienced a great renewal by the Holy Spirit in the second year of his priesthood and that was the key to his very effective ministry. He began teaching the Bible and could see the powerful way that the Holy Spirit worked through the Word. Fr. Al was faithful to the Catholic Church and dedicated to the priesthood. He tirelessly administered the sacraments inviting all Catholics to encounter Jesus daily in the Mass and Holy Communion. Fr. Al evangelized diligently to the ends of the earth, always teaching whether convenient or inconvenient. He raised up leaders by providing formation, teaching, and networking small Christian communities. He challenged the Catholic faithful to fully live their baptisms and vocation. Fr. Al was a witness to gospel poverty and champion of the unborn. The Presentation Ministries Bible Institute, The Our Lady of Guadalupe Chapel and Retreat Center, and Guadalupe Bible College were founded by Father Al to provide teaching to equip the laity. His vision was to raise up lay people as disciples of Jesus. He charged us to accept Christ’s call to live a simple lifestyle in order to spread the gospel. Fr. Al was received into his heavenly home on October 13, 2002. We know even now, he along with many others in Presentation Ministries who have departed this life are a great "cloud of witnesses" (Heb 12:1) who are praying for us and this ministry.